The Atlantic Economic Corridor (AEC) will drive significant regional development, complementing and balancing Ireland’s thriving East Coast. The AEC is the term applied to a non-administrative or “linear” region along the Western seaboard, stretching from Kerry to Donegal. The aim is to build and increase collaboration within the AEC that maximises its assets, attracts investment and creates jobs and prosperity in the region. The Department of Rural and Community Development is the department that is helping to progress the project and develop a clearly articulated road-map for delivery of the AEC objectives. The AEC task-force is chaired by Minister of State Seán Canney. The Atlantic Economic Corridor initiative provides an opportunity to create an accelerated, more responsive pathway for regional development in Ireland. Improved connectivity will be vital to unlock the economic and social potential of the Atlantic region. That includes physical improvements in road, rail and other transport infrastructure but also the digital connectivity that has the power to transform and energise rural areas. Delivering 21st-century connectivity must a be a priority to support modern business practices and grow economic opportunities in the Atlantic region. Similarly, utilities such as gas, water, and renewable energy need to be developed in a strategic manner to maximise the potential of the region. The Marine Economy is an area of growing importance for Ireland. The ongoing development of Ireland West and Shannon airports and of the key ports of including Foynes and Galway are also key priorities. All of this can be achieved while remaining consistent with current national and regional strategies. 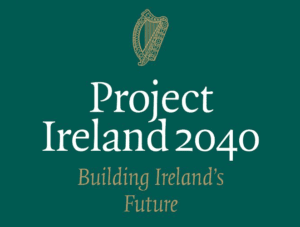 Project Ireland 2040 was launched by the Irish Government in February 2018. It is the overarching policy and planning framework for the social, economic and cultural development of Ireland. It consists of both a 20 year National Planning Framework and a 10 year capital investment plan, the National Development Plan 2018-2027. The National Planning Framework has been developed in parallel with the National Development Plan to ensure a coordinated approach to how we invest in public infrastructure in a way that ties in with our national spatial priorities. A key strategic objective of the National Planning Framework and the National Development Plan is to promote economic development across the regions and to enable all parts of the country to achieve their full potential. Therefore, Project Ireland 2040 is strongly supportive of the Atlantic Economic Corridor which is contributing to the achievement of our spatial and economic policy objectives. M17/M18 motorway between Tuam and Gort – which opened in September 2017. The 57km stretch of motorway significantly improves connectivity along the AEC. Estimated investment of €850m – €900m in the M20 Cork to Limerick motorway over the period to 2027. Estimated investment of €550m – €600m for the Galway Ring Road in the period to 2025 – improving connectivity and travel times within and around Galway City. Significant investment in the National Roads Network along the corridor including the N4 Collooney to Castlebaldwin which will greatly improve travel times to and from Sligo. Estimated capital investment of €150m in the period to 2022 by Shannon Group, developing their property portfolio to deliver high quality advance manufacturing, warehousing and office space solutions. Investment of €27 million in Shannon Foynes Port over the period to 2022, increasing capacity and land access through the upgrade of the N69 and reinstatement of the Limerick-Foynes rail line. Commitment through the National Broadband Plan to ensure high speed broadband network throughout the country, including along the AEC. Nationally it is expected that 90% of premises will have access to a high speed broadband service by the end of 2020. A national programme of investment of €8.5 billion for water services provision, ensuring a safe and resilient water supply for people and business. Urban centres throughout the AEC region will have a key role to play in Ireland’s future economic development. It is important to recognise that urban growth centres support employment opportunities and economic potential for the wider region, including rural areas. The presence and, importantly, the accessibility of regional growth centres with good job opportunities, will serve to support the retention of people in the region and can act as a brake to outward migration from rural areas. Each county in the AEC region has its own strengths and assets. These include built and natural assets, third-level Institutions and competitive enterprise sectors, including Agri-Food, BioPharmachem, Lifesciences, the Marine Economy and ICT. There is also potential, over the next 25 years and beyond, to capitalise on the potential of renewable energy resources, including on-shore and off-shore wind energy, wave energy and solar power. The region, as a whole, shares a wealth of tourism assets and has the opportunity to capitalise on the success of the Wild Atlantic Way and the profile it has developed along the Atlantic seaboard.